If food prices were based on nutritional value, the humble carrot would be far more expensive. Carrots are the leading source of beta-carotene -- and therefore an important source of vitamin A -- in the American diet, according to “Wellness Foods A to Z: An Indispensable Guide for Health-Conscious Food Lovers.” Fully mature baby carrots are about half the size of regular carrots. Although both varieties pack the same nutrients, baby carrots contain slightly lower amounts. Carrots get their bright orange hue from beta-carotene, a fat-soluble substance that converts to vitamin A in your body. Vitamin A helps maintain immunity, organ function and normal vision. The amount of beta-carotene in a 1-cup serving of the sliced raw vegetable amounts to about 410 percent of the daily value for vitamin A, as set by the Food and Nutrition Board at the Institute of Medicine. Baby carrots are about 20 percent lower in vitamin A, but they’re still an excellent source of the nutrient. Regular carrots are a good source of vitamin C, providing 12 percent of the daily value per cup of sliced raw vegetable. Not only is this water-soluble nutrient essential to healthy skin, gums, teeth and bones, but it also enhances iron absorption and protects cells against free-radical damage. Baby carrots are about 55 percent lower in vitamin C than the larger variety. Although baby carrots aren’t considered low in vitamin C, they don’t count as a good source, either. A cup of sliced carrots supplies 20 percent of the Food and Nutrition Board's daily value for vitamin K, a nutrient that supports bone health and makes it possible for blood to clot. While your body manufactures a significant amount of vitamin K, it’s not stored in large quantities, so you still need to get some from your diet. Baby carrots are almost 30 percent lower in vitamin K than the regular variety, but -- at 14 percent of the recommended daily value per serving -- they still qualify as a good source. Carrots are also a good source of potassium -- a 1-cup serving offers just over 10 percent of the daily value. As an electrolyte, potassium helps keep fluids and minerals balanced throughout your body. It also counteracts the effects of sodium and helps reduce high blood pressure. Because baby carrots are about 25 percent lower in potassium than regular carrots, they don’t qualify as a good source of the mineral. All carrots are a good source of dietary fiber. Whether you choose baby carrots or the regular variety, you’ll get about 3.4 grams of fiber, or 14 percent of the daily value, per cup of sliced vegetable. Carrots contain a special kind of soluble fiber known as calcium pectate. According to “Wellness Foods A to Z,” calcium pectate is particularly effective at eliminating fatty acids and reducing high cholesterol levels. You’ll get about 50 calories from two medium-sized carrots or a cup of sliced carrots. 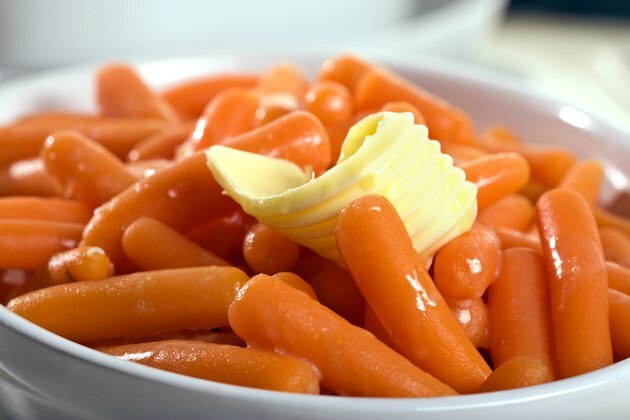 It takes about 12 medium-sized baby carrots to make a 50-calorie serving of the smaller variety. Don’t confuse small bagged carrots for baby carrots -- they’re simply regular carrots that have been peeled and shaped into snack-sized portions. Are Green Kiwi Fruit & Gold Kiwi Fruit Nutritionally the Same?